PITTSFIELD — It was a special effect that no one expected. Shortly after the start of the second act of “Jesus Christ Superstar,” staged in Caracas by a theater company based there, musical director Salomon Lerner noticed an unusual amount of smoke drifting down into the orchestra pit. Annoyed, he wondered why the technical crew was being so liberal with the smoke machine. But something had gone very wrong. “After a certain point, the woodwinds just stopped playing. They were coughing,” Lerner says, sitting in the basement cabaret beneath the St. Germain Stage at Barrington Stage Company. It turned out that someone had lobbed a tear gas canister into the backstage area. Lerner and his creative partner, director Michel Hausmann, believe the act was retaliation for a much-publicized incident in which they rejected a lucrative sponsorship deal for the show because, they say, the conditions required that they advertise only in media outlets considered supportive of then-president Hugo Chávez. The tear gas was relatively contained; and though the actors huddled behind the set between scenes rather than venture backstage, the audience wasn’t aware of what was going on. Hausmann was advised that the worst thing would be for the large crowd to learn what had happened and flee in panic. The show had to go on. Composer Salomon Lerner, writer Michel Hausmann, and lyricist Len Schiff. Listening to Lerner and Hausmann tell the story, on a lunch break during rehearsals of their newest project, Barrington Stage’s guru for new musicals William Finn breaks in. “You went on with the show? You people! I would have been on the next flight out of there,” he says with apparent astonishment. 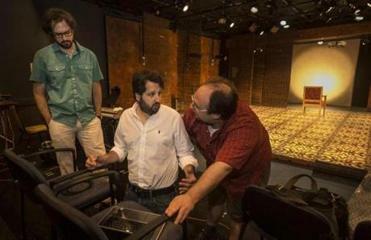 The team expects far less controversy with “The Golem of Havana,” their original musical making its world premiere at Barrington Stage. Set in Cuba on the eve of Fidel Castro’s revolution, the story centers on an immigrant family of Hungarian Jews who sought refuge there after the Holocaust. The poor family is on the brink of rising into a less precarious situation when its maid’s son is implicated by police in the brewing uprising. The events are framed by flashbacks to World War II, nightmares, and the imagination of young daughter Rebecca, who draws comics featuring a golem — the supernatural figure from Jewish folklore who is brought to life from mud or clay to defend against persecution, but eventually becomes unmanageable and must be put back to sleep. It’s the first original musical by Hausmann (book writer) and Lerner (composer), who are joined by lyricist Len Schiff. An earlier version was seen in a workshop production last August at La MaMa Experimental Theatre Club, in New York. 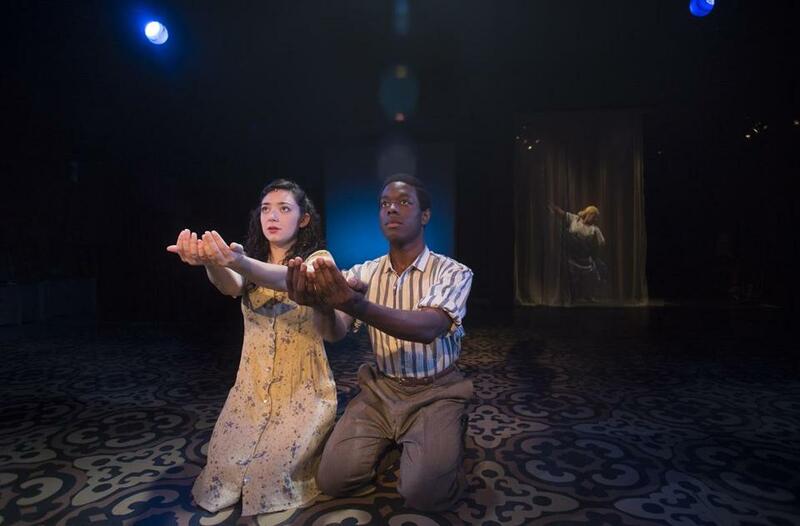 “Golem” is the centerpiece of the 10th season of Barrington Stage’s Musical Theatre Lab, Finn’s incubation center for new work. Hausmann and Lerner were both born to Jewish families in Caracas, a week apart. (They’ll turn 33 during the show’s run.) They’ve been best friends, they say, since before they can remember. Though they set this story in a different historical milieu, it’s very much informed by their experiences as second-generation Jews whose grandparents survived the Holocaust and made a new home in an unfamiliar place. They didn’t expect to become exiles themselves. But that’s exactly what happened. The 2010 tear gas incident wasn’t their first brush with politically motivated controversy. The year before, the orchestra they’d hired for their production of a translation of “Fiddler on the Roof” walked off the job 10 days before the show opened. Hausmann says he was told the orchestra couldn’t risk being associated with a “Jewish show” at a time when the conflict between Israeli and Gaza was intensifying and Chávez had recently expelled the Israeli ambassador. Lerner scrambled to hire replacement musicians, and when they entered the theater for the first show the audience rose to its feet for an ovation, chanting “los valientes” (“brave ones”). It was stirring stuff, but the offstage drama (and menace) seemed a good cue to relocate to the United States. They’d been here before. Hausmann attended Emerson College and Lerner went to Berklee College of Music. They also attended a graduate program on musical theater at New York University, where Schiff, who was an instructor there, introduced them to the work of Finn. Finn eventually brought Lerner to Pittsfield as his assistant and the resident composer at Barrington Stage for the 2011 and 2012 seasons, where they wrote a song together and Lerner performed a showcase of his original work. It’s also a way of getting at the heart of the Cuban revolution, as well as political turmoil in his native Venezuela, Hausmann says.